She is the Chief Operating Officer of Facebook. Time Magazine named her in its "Time 100" list for 2012, the magazine's annual list of the 100 most influential people in the world. From 1996 to 2001, she was the Chief of Staff to the United States Secretary of the Treasury under President Bill Clinton and from 2001 to 2008 she was Vice President of Global Online Sales & Operations at Google before going to Facebook. Sandra Sandberg is a leader. Sandra Sandberg is also a woman. Long before Sheryl Sandberg left Google to join Facebook as its Chief Operating Ofﬁcer in 2008, she was a fan. Today she manages Facebook’s sales, marketing, business development, human resources, public policy and communications. It’s a massive job, but one well suited to Sandberg, who not only built and managed Google’s successful online sales and operations program but also served as an economist for the World Bank and Chief of Staff at the US Treasury Department. Sandberg’s experience navigating the complex and socially sensitive world of international economics has proven useful as she and Facebook founder Mark Zuckerberg work to strike a balance between helping Facebook users control privacy while ﬁnding ways to monetize its most valuable asset: data. The first time I heard Sheryl Sandberg, COO of Facebook, say that women lack ambition, I thought, "She's an executive, not a researcher. This idea will be disproved." Yet she continues to be given a platform to tell this story. People continue to listen. This is another low blow to high-achieving women. Women are not motivated by the traditional "carrot and stick" approaches that business counts on. Young women often don't realize the barriers to their success are still so strong. Women are told to act like men and are then chastised for this behavior. Women shy away from important career-defining conversations, such as negotiating how and where they do their work, asking for promotions and letting people know about their accomplishments. I find it interesting listening to both Sandra Sandberg and the criticisms. What came first the chicken or the egg? Are women less ambitious or are they taught to be less ambitious? Are they less ambitious than men or are they ambitious in a different way than men? Technically, any woman can do any job a man can do. Okay, except being a sperm donor. But from there, when we stand back and look at the whole of society, we seem to be collectively sitting in some sort of divide between the traditions of our past and the new ground we're breaking for the future. Twenty years ago I moved into a new apartment and set up an appointment for Bell to come and install my phone. I heard a knock at the appointed time and opened the door to a female technician. If I was mildly startled, it wasn't because I thought a woman couldn't do the job, it was because I had never seen a woman doing that job in my life. Our society is changing but it is in many ways changing far slower than we realise. Traditions are hard to get rid of because removing them leaves the situation unstable. People are uncomfortable and don't know exactly what to do. Yes, change will come but it may be more due to the older generation dying off and taking their traditions with them. The new generation will be more accepting of change but they too will have the problem of figuring out just what the "new traditions" will be. FYI: Many attribute the Tomothy Leary quote to Marilyn Monroe. My research shows this not to be true. The major quotation web sites say Tomothy Leary and the fan web site Immortal Marilyn point out the same error. Sheryl Kara Sandberg (born August 28, 1969) is an American businesswoman. She has served as the chief operating officer of Facebook since 2008. In June 2012, she was also elected to the board of directors by the existing board members, becoming the first woman to serve on its board. 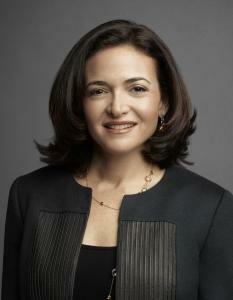 Before Facebook, Sandberg was Vice President of Global Online Sales and Operations at Google. She also was involved in launching Google's philanthropic arm Google.org. Before Google, Sandberg served as chief of staff for the United States Department of the Treasury. In 2012, she was named in Time 100, an annual list of the 100 most influential people in the world assembled by Time.